Home / entertainment / events / Girls night out! The people at Zouk have again come up with something fun for the next few Mondays. Launching the “Zouk Girls Night Out” with Fashion evenings where we would like to request all interested ladies to come dressed in their best and walk the ramp. A prominent jury will be selecting the five best ladies every Monday and then these ladies will go to the semi-finals and final event on February 14th - Valentines Day. The Short-listed ladies can win the title of Ms. Zouk 2011 and also would be part of the Zouk Calendar to be launched in February. Plus there are some really exciting grand prizes to be won! Not enough???? How about complimentary beverages every Monday at Zouk? 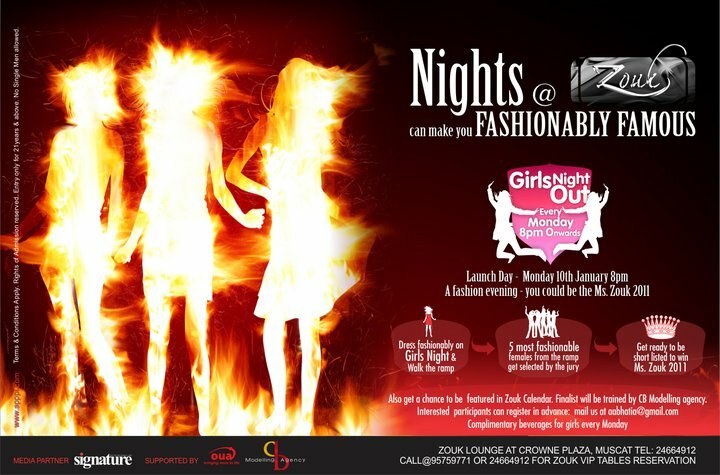 Yes all the ladies get complimentary beverages from Zouk every Monday evening. You can see some celebrity bartenders every Monday and different themes promoting the local talent. So all the interested ladies who would like to walk on the ramp please send us your interest at aabhatia@gmail.com or message us here on Facebook. And if you've got the talent we've got the platform for you....inviting all the talents like musicians, bands, performing artist, singers, painters, fashion designers etc to write to us. Don’t forget the first round and launch is on this coming Monday 10th January 2011 at 8pm. Cover Charge for guys is RO 10/- and as always is redeemable against their bill. Entry to the event and Zouk is strictly for 21 years and above. It'd be cool if they judged the style and fashion, not the beauty necessarily. Agreed OPNO...should be "five best dressed ladies" not "five best ladies". Creepy..
Another nail in Muscat's ever decreasing nightlife/entertainment.